The giver of this gift, put me to the test. I had previously bragged to my dear Jennifer that the only curves that rivaled her own were those of my whisky bottles. Needless to say, she did not see the humor. So, how do you even pronounce it? And what does it mean? Good questions. I’ve heard it pronounced “ah-boo-NAH-duh.” It is Gaelic for “original.” But you didn’t buy it for linguistic training, did you? You bought it because you were intrigued by the opportunity to enjoy something special, something unlike the others you’ve loved before. But before the intrigue is indulged, the origin of this particular whisky is wrapped with an interesting yarn. It is said that in 1975, some workman were installing a new still when they uncovered a time capsule hiding a very old bottle of Aberlour that had been wrapped in a newspaper from 1898. What did the men do? Did they run to the Master Distiller and deliver the exciting news of the discovery? Did they lay it gently back into its chamber, tucking it back into its keep? Nope. They opened it and drank it, leaving only a tiny bit. Once it was discovered what had happened, the remaining portion was sent to a lab for analysis. Hopefully, while the chemists did their work, the Master Distiller was busy putting those workmen into the time capsule, welding it shut, and putting it back into the floor. At the time of this writing, there have been 39 different batches released, all offering an ABV between 58% and 61%. This particular edition, noted as being born of batch 36, registers at 60.1%. Most connoisseurs seem to agree that each batch offers different wonders. However, batch 36 was a long way from my first encounter with batch 17 and yet it was everything I remembered so fondly: rich, full, and cherried; leaning to brandy-like. 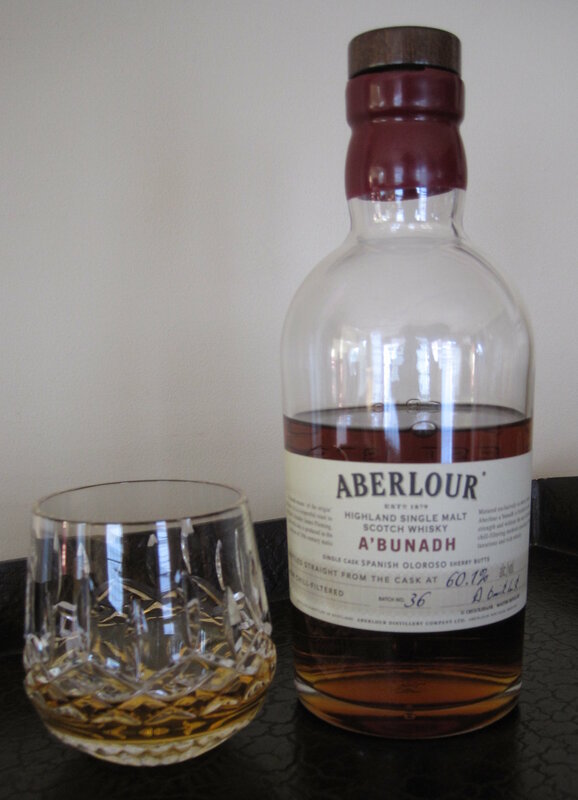 On second thought, if the ground opened beneath your feet and an ancient bottle of Aberlour appeared, why would you not drink it assuming that Heaven had smiled upon you and your labors? Sleep well in the capsule, men. I suppose I would have done the same. Thanks for letting me camp out in your blog today. This was a lot of fun. I tried to leave my campsite as clean as when I arrived. Thanks for stopping by. I’m glad you had fun. Be sure to make certain that the campfire is fully extinguished as there are a lot of combustable liquids in this place.